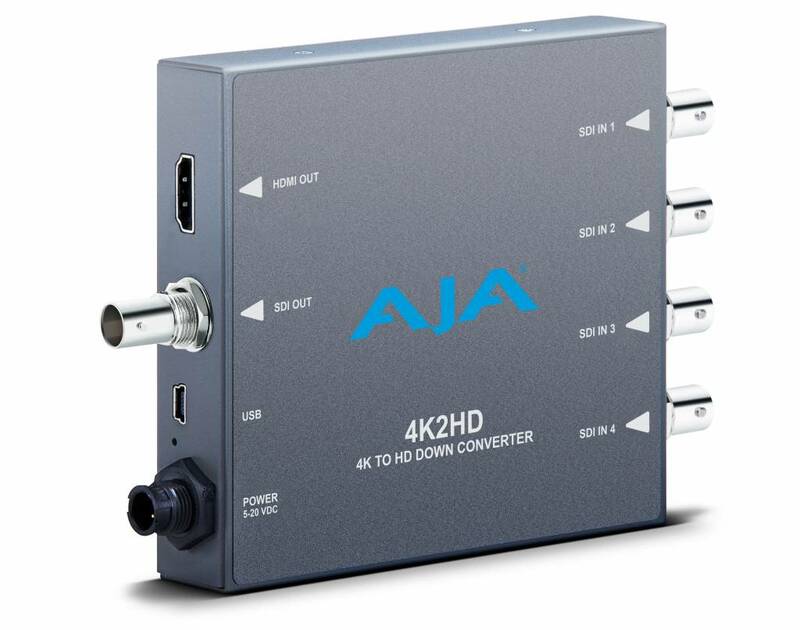 AJA’s 4K2HD down-converts professional SDI 4K/UHD signals to HD resolution using AJA’s high-quality scaling for cost-effective monitoring and conversion. 4K2HD’s HD-SDI and HDMI outputs are both live all the time, producing fantastic-looking HD images for on set monitoring or direct-to-air broadcast. 4K2HD outputs SDI and HDMI simultaneously. 4K2HD supports high frame rate (HFR) 4K inputs at 50 and 60fps and gets converted to HD outputs at 50 and 60fps for accurate viewing. 4K2HD’s configuration options can extract an HD resolution image from the 4K input to provide a one-to-one pixel image for 4K focus checks on HD displays. Configuration can be set remotely via AJA MiniConfig software control over USB. 4K2HD uses real time processing and AJA’s high-quality scaling algorithms to downconvert professional 4K or UHD signals using 4 × SDI connections to HD resolution, producing fantastic-looking HD images for on set monitoring or direct-to-air broadcast. 4K2HD’s HD-SDI and HDMI outputs are live all the time, allowing use of both professional SDI monitors as well as low-cost HDMI monitors simultaneously. No matter what monitors you have on hand, 4K2HD can use them for on the spot 4K viewing. Many 4K productions are opting for higher frame rates of 50 and 60fps. 4K2HD supports high frame rate (HFR) 4K inputs and converts the HD output to a matching frame rate for accurate viewing so what you shoot is what you see. 4K2HD can be configured to extract an HD resolution center cut from the 4K input. This provides a one-to-one pixel image that can be used to check focus on 4K shoots without the need for a full 4K monitor. AJA’s free Mini-Config software can be used with any USB-enabled AJA Mini-Converter and provides an easy-to-use graphical interface with detailed information about the current input and output formats. Control all the parameters of any supported AJA Mini-Converter as well as loading firmware updates from AJA that add new features and functionality. 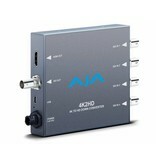 All AJA Mini-Converters are covered by a 5 year warranty and AJA's advanced replacement policy. If a replacement is necessary, AJA will ship a new unit immediately without the need to send the original unit back first, ensuring you are up and running again as quickly as possible.